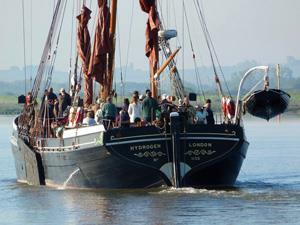 Topsail Charters01621 857567work Boat TripsSailing Barges ‘Thistle’ built in 1895 and ‘Hydrogen’ built 1906 were once part of the East Coast's traditional fleet of cargo vessels; two of over 2,000 barges then. Today only a handful survive. A gentle cruise on one of these vessels allows you to enjoy the beautiful and peaceful rivers of the East Coast in a memorable and interesting way. Join us for one of our public cruises or be part of a group booking, catering for up to 50 people. Sailing Barges ‘Thistle’ built in 1895 and ‘Hydrogen’ built 1906 were once part of the East Coast's traditional fleet of cargo vessels; two of over 2,000 barges then. Today only a handful survive. A gentle cruise on one of these vessels allows you to enjoy the beautiful and peaceful rivers of the East Coast in a memorable and interesting way. We also offer weekend breaks for groups of up to 12 people. Escape your world and relax in ours! Sorry disabled access restricted - please contact us for further guidance. Available any day, any time. Private Hire - depends on location, duration etc - please ring office. Public trips - full programme with prices on our website. Sat 27 - Sun 28 Apr Topsail's Big Barge Weekend! Maldon Quay - from A12 South take A414 for Danbury and Maldon and follow into Maldon. Follow signs for town Centre and come down High Street. At bottom of high street, take left fork down Church Street to Quay. Parking at bottom of High Street in Edward Bright Close (Marked "P-Hythe Quay". From A12 North take exit for Witham and follow signs to Maldon. Timetables and information can be accessed via the public transport information partnership Traveline South East. Traveline allows you to plan journeys from and to a postcode, postal address, town or village, named station or stop, or point of interest. Call 0871 200 2233 to speak to an operator and plan your journey, or log onto www.travelinesoutheast.org.uk and simply type in where you are travelling from and to for a detailed trip summary.